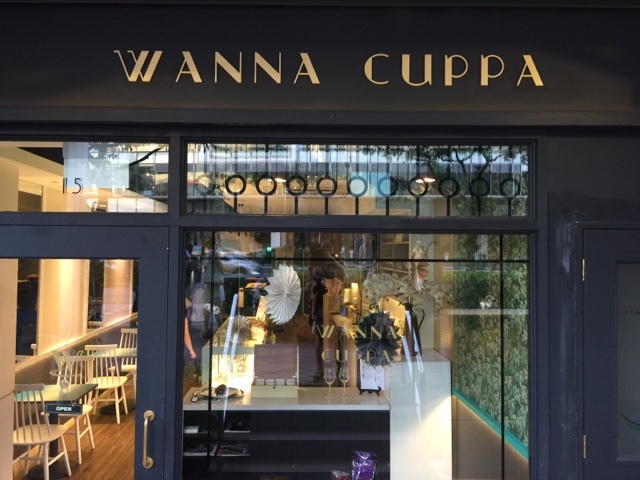 Wanna Cuppa - the name of a cafe that sounds so rhythmically rhyming and specialises in making every conversation held there a comfortable one. 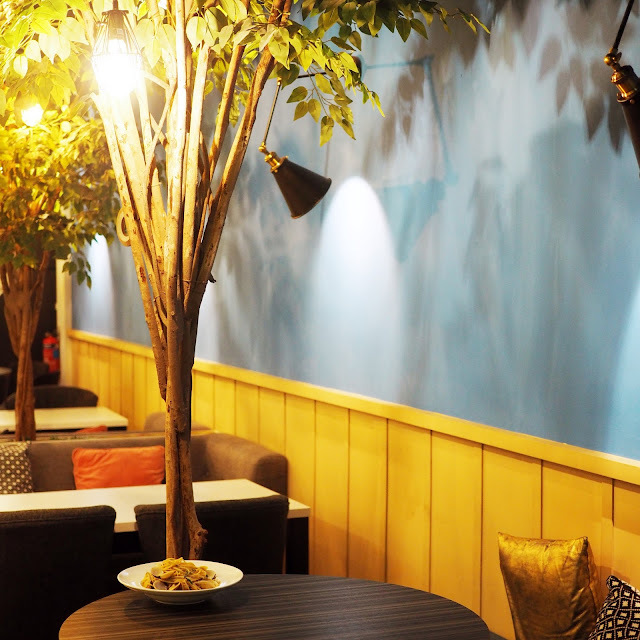 The exterior is not only majestically inviting with its gold large capital font, you can expect beautifully planted trees inside the cafe in a pretty spacious space. 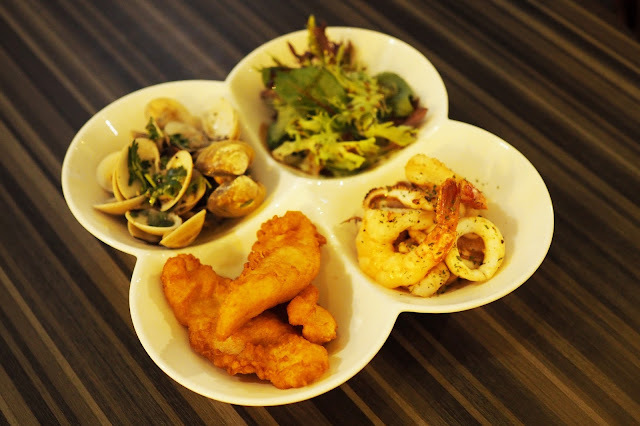 This place is a stone's throw away from Clarke Quay MRT station and it is located right beside the famous Song Fa Bak Kut Teh at New Bridge Road. We were there for an invited tasting (thanks Kris!) to try out their new, revamped menu. 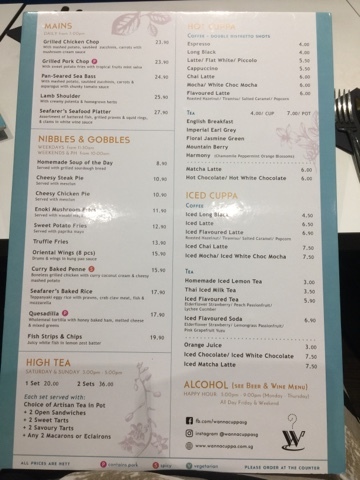 The menu is in the form of a large oversized board, which makes it kinda difficult to pass round the table. 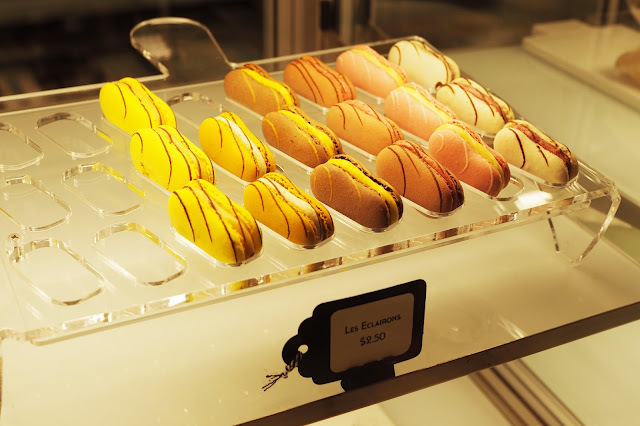 I liked how each item describes the component of the dish (a rarity in some cafes). 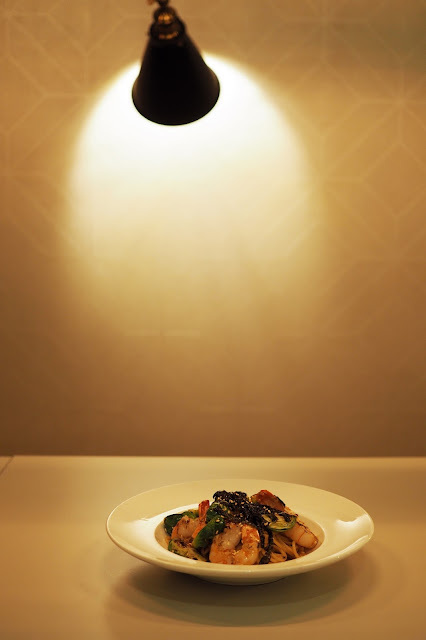 The description is relatively clear-cut, there is no fanciful adjectives that would make you misjudge the quality or create higher expectations of the dish you'd order. 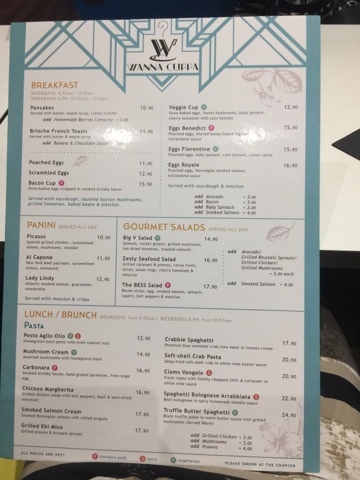 There is also breakfast and lunch sets for the working crowd— a breakfast promo costs only $5.50 and it's so much better and healthier than your Big Breakfast from McDonald's. 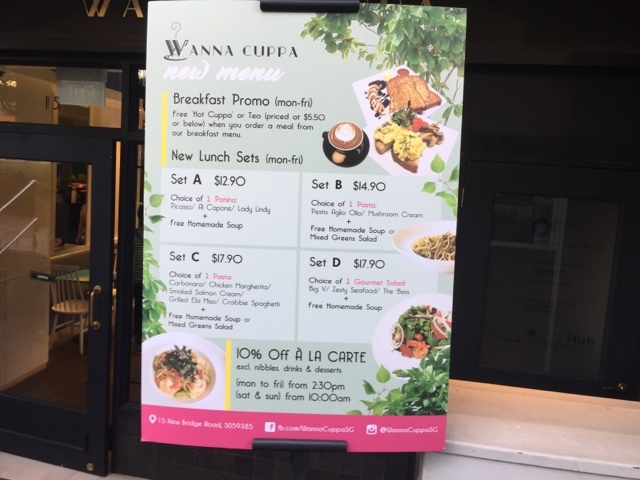 Lunch sets start from S$12.90— and if you order during weekdays from 2.30pm or weekends from 10am, you get to enjoy additional 10% OFF A La Carte! Interior of the cafe - Look, there's trees on the table! 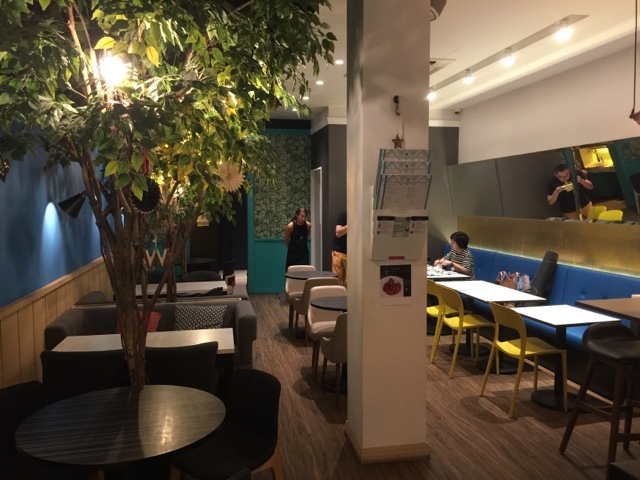 The cafe's spaciousness makes it really enjoyable — i remember visiting a few cafes where every table is so close to each other that it's HARD not to eavesdrop on another's conversation. We were there on a weekend night and almost had the entire cafe to our ourselves! 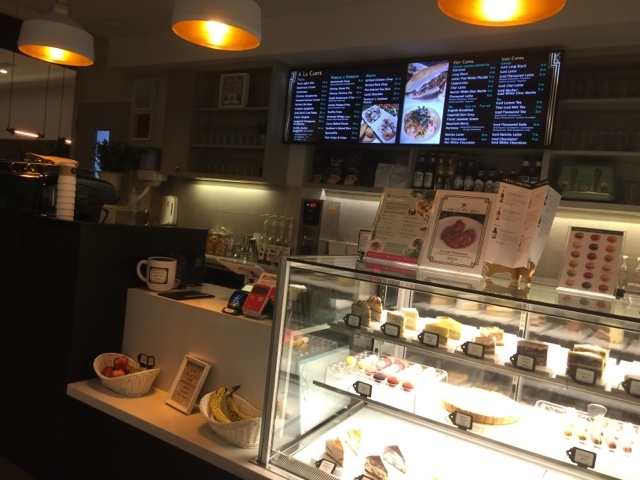 The desserts and fruits counter - the cafe accepts cash, VISA and Nets. It's my first time coming across this innovative Enoki Mushroom Fries (SGD $11.90). Absolutely a great starter and snack! We shared this among 6 people and it was quite sufficient for us— I love the Wasabi Mayo that goes along with it too. It had a good balance between the pungent wasabi and the creamy mayo. 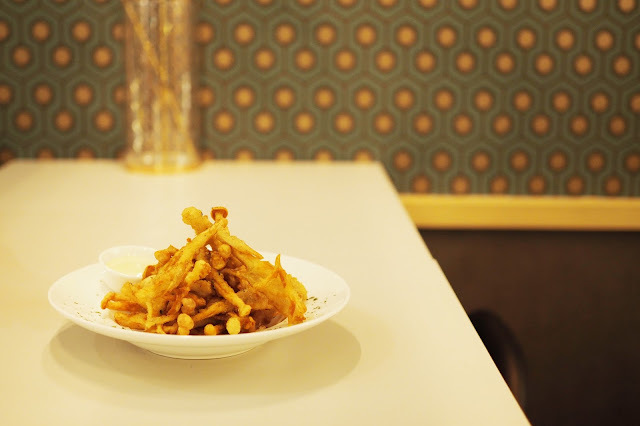 The enoki fries is very crispy on the outside and a little juicy on the inside. Best of all, it's not too oily. I'll get this again the next time I visit! 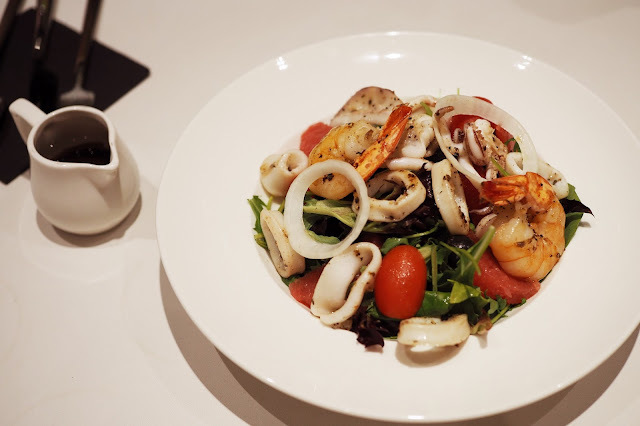 This dish contains Grilled Calamari & Prawns, Citrus Fruits, Olives, Onion Rings, Cherry Tomatoes & Mesclun. It's hard to please people with salads — you either love it or hate it. 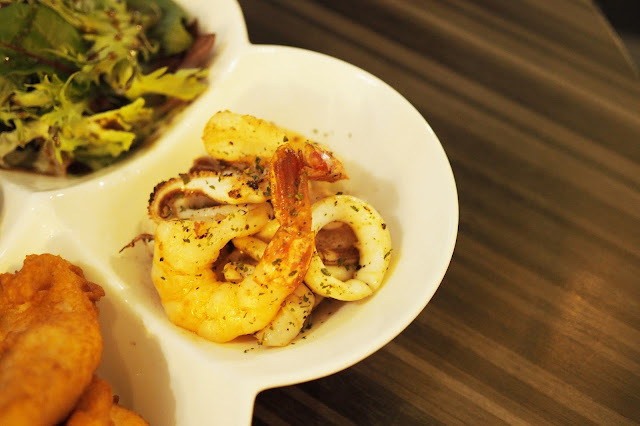 If you love seafood such as large succulent prawns and sotong, this dish is made specially for you. 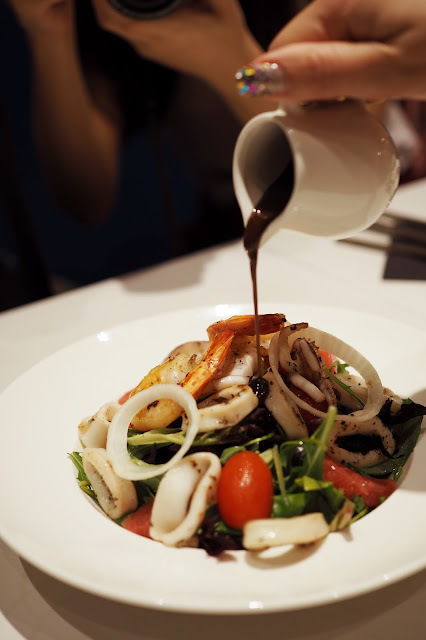 My personal preference would be a sweet salad— this was more sour due to the balsamic vinegar sauce. 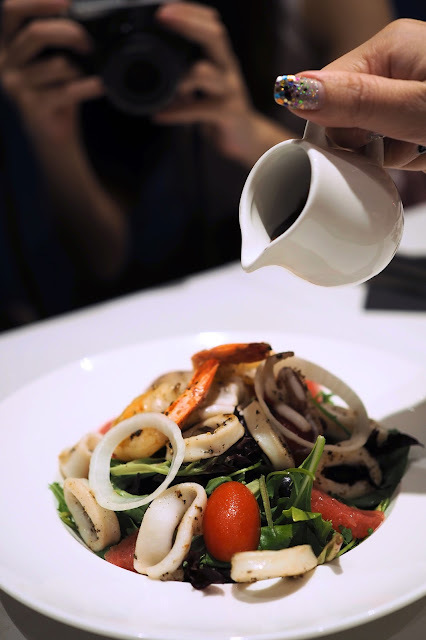 It's a great health booster, especially for office workers around the area who seriously lack good nutrition (I mean, how often can you find a good plate of salad in Singapore?). They were very generous with their ingredients. 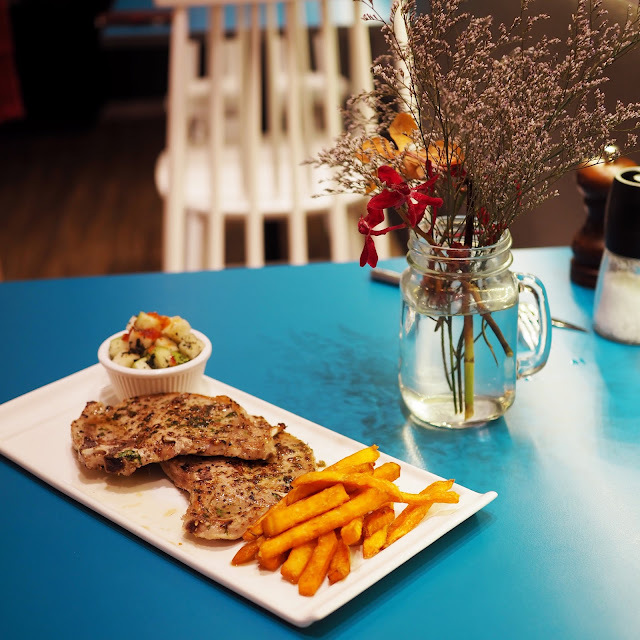 As the cafe owner, Jeanette, advised, eat the pork chop before it turns dry! The pork chop was grilled evenly and the thickness of each cut was just right. 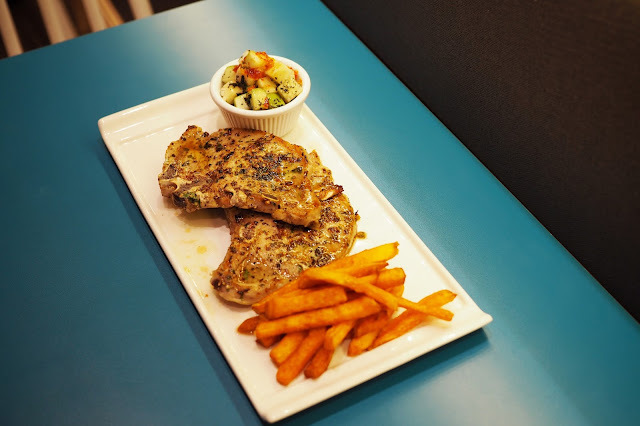 The marinate is absolutely heavenly — there was a slight kick from the pepper combined with a savoury sweetness of herbs and other ingredients which I can't figure out. However, the texture was a little too firm— perhaps it's because we took about 10 minutes for photo taking. Tiara (@herpenandfork) and I fought over the crisp sweet potato fries — but I was actually a huge fan over their homemade salsa, a refreshing tongue-awakening combination of green apples, mint, balsamic vinegar, and chili. It was an immediate palate cleanser and I hope they'd have an entire bowl of that! This is one dish which I aspire to make at home — Grilled Prawns & Brussel Sprouts is not a common dish that you'd find at restaurants or cafes. 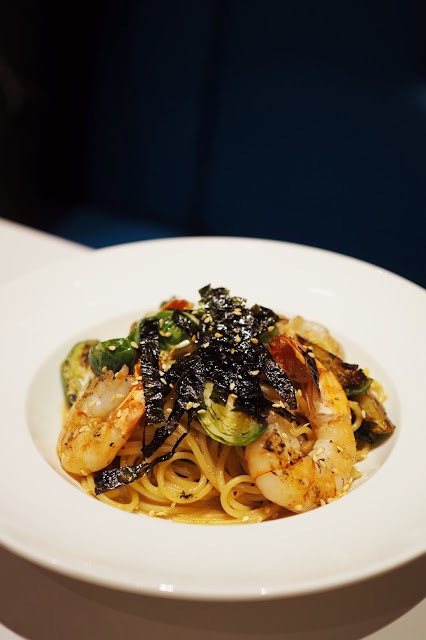 Each strand of spaghetti is al dente, and combining that with the smoky grilled peeled and devein prawns makes me greedy for more. 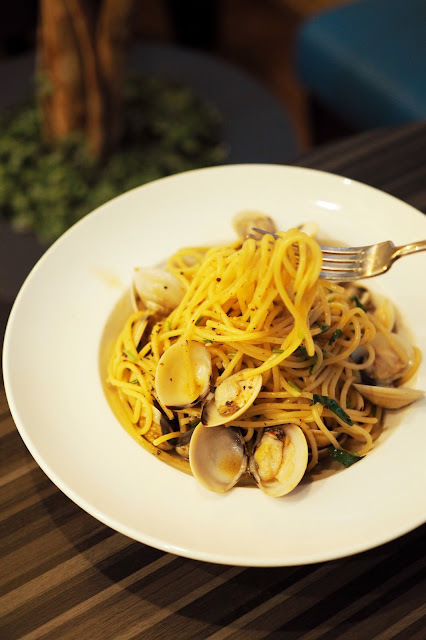 This is the star dish of the night — but unfortunately, due to my personal bad experience of eating clams, I have decided to avoid clams altogether. however, the other bloggers absolutely love this though! 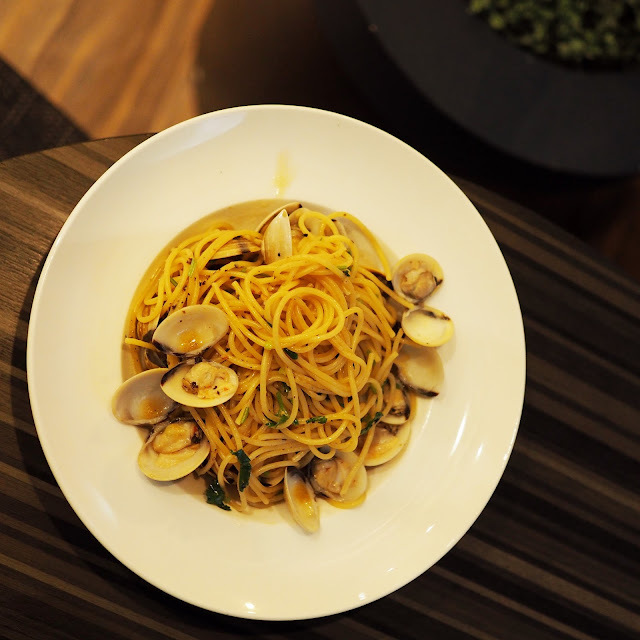 The pasta is mixed in white wine broth. Garnishing included the freshwater clams, coriander, and freshly chopped chili. 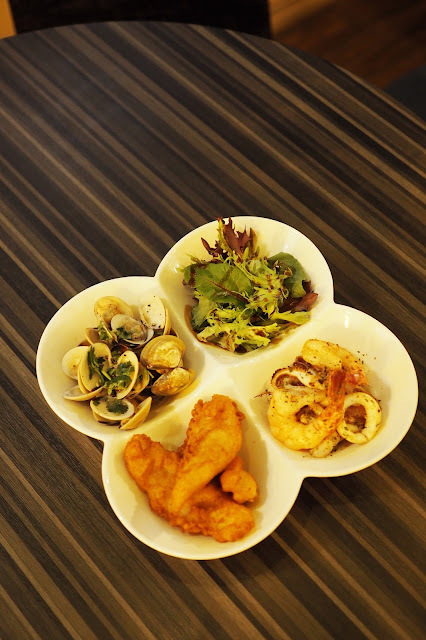 We ended the tasting session with the Seafarer's seafood platter, a dish that consists of an assortment of Battered fish, Grilled Prawns, Squid Rings as well as Clams in White Wine Sauce One of the bloggers felt that it was a summary of all the dishes we've tried so far— it's a great tasting portion for people who would want to sample a variety of ingredients. 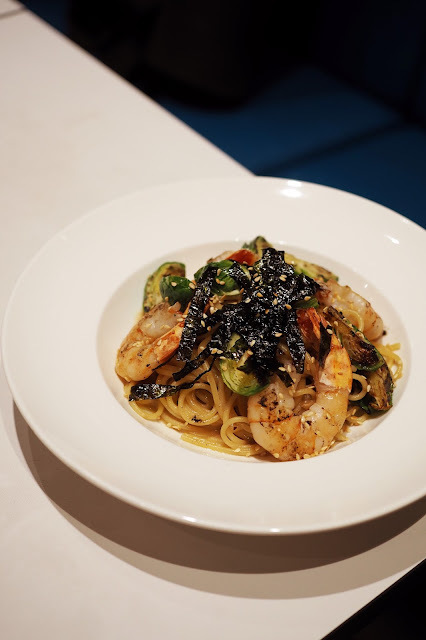 The grilled prawns were juicy and sweet, same as the one we had for Grilled Ebi Miso pasta. 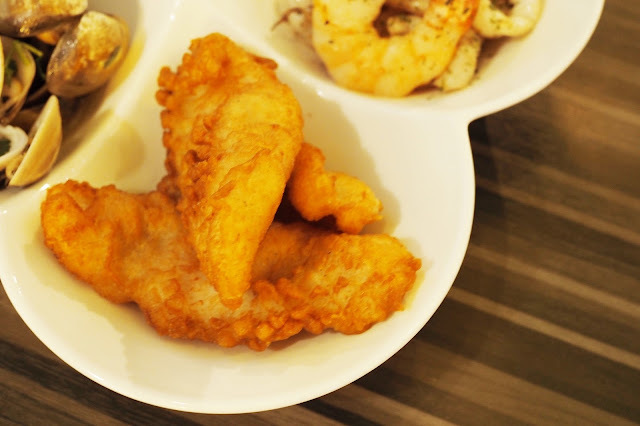 The battered fish was my favourite as it has a crisp exterior with juicy and flaky interior. Thanks Jeanette for the warm hospitality. This was an invited tasting session - for reviews from other attendees, you may wish to read Purple Taste, msginginly, Jelly Love Fats, Her Pen And Fork, and IvanTehRunningMan.